The sustainable design movement encourages energy code compliance, daylighting, individual user control, responsible outdoor lighting and control system commissioning. But it also promotes exceeding energy codes that are already strict, resulting in lighting choices that may be guided more by the energy consumption of buildings than the visual needs of their occupants. Indeed, the very notion of exceeding an energy code appears to contain inherent risks, even though the LEED green building rating system and even a Presidential executive order mandating upgrades for Federal buildings are all based on this approach. If energy codes are developed based on available technology and IES recommendations for light levels, why push beyond to save energy when doing so might compromise user satisfaction and productivity? The traditional answer is that it is possible to have good design and very high efficiency largely due to technology that has already leaped ahead when a new code is announced, as these programs simply seek to stimulate demand for existing cutting-edge solutions. This argument is reaching a point of diminishing returns, however, as codes are becoming so restrictive they are beginning to consume cutting-edge technology themselves. To continue going beyond, we’re going to have to rethink codes in terms of energy consumed instead of power installed, wholeheartedly embrace advanced controls, and focus on design instead of just technology. But does the specification community have the expertise to achieve these goals outside those projects produced by the top designers in the field? The U.S. Department of Energy (DOE) has taken a different approach with its Commercial Lighting Solutions (CLS) program, a component of Commercial Building Energy Alliances, private-public forums seeking to reduce energy consumption by significant levels in new and existing buildings in their vertical building markets. CLS seeks to stimulate adoption of advanced lighting technologies and design practices by making them available to the broader lighting specification community, not just the leaders in the field. The result is an extraordinary interactive web tool that enables any lighting decision-maker to save 30% more energy than the ASHRAE 90.1-2004 standard energy code without sacrificing lighting quality that users need from lighting systems. (It’s important to note that CLS is based on saving kWh through design, not kW solely through equipment choices.) Intended users include designers, owners, contractors, distributors and others interested in the latest sustainable, energy-efficient solutions. CLS provides design templates enabling lighting specifiers to achieve 30% more energy savings than the ASHRAE 90.1-2004 energy standard without sacrificing lighting quality. DOE has started with the retail market, identifying a range of space types and then engaging expert lighting designers to work with building owners, architects and manufacturers to produce design templates for typical spaces that can be used in new construction and relighting projects. 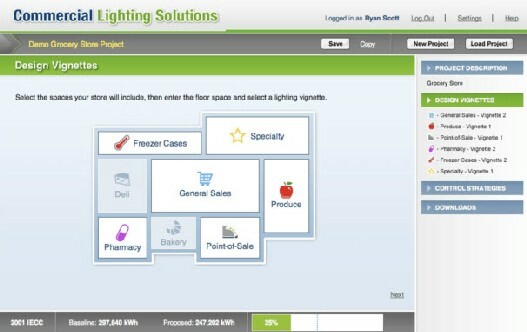 Called “vignettes,” these templates include lighting layouts, controls recommendations, projected demand and energy savings, component specifications and supporting documentation. This is only the beginning. In the future, the tool will project energy cost savings and link designers to participating utilities, where applicable, to access rebates and other financial incentives for their design. CLS will also expand to include more templates in retail and later reach out to other building categories such as office and institutional buildings. Note that some lighting expertise is needed to understand and implement the design recommendations, and higher expertise will be needed if your project is atypical or has special lighting needs, as CLS was designed to target typical conditions in mainstream construction. CLS version 1.0 for retail buildings is free to the public after officially launching at Lightfair International in early May. Get it free here: https://www.lightingsolutions.energy.gov.